Hello again! Glad to see I didn’t scare you away with my earlier ramblings. 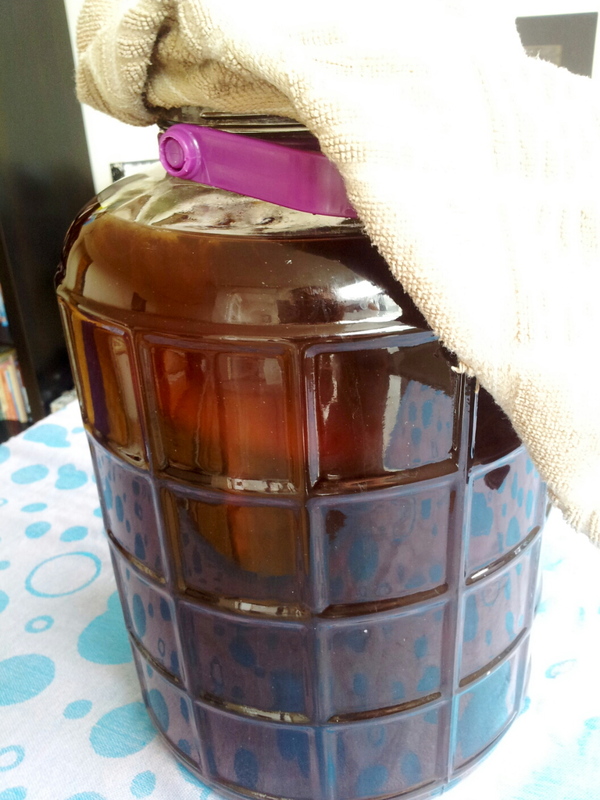 As promised today I’m going to teach you all about SCOBYs (pronounced scoh-bee) and kombucha and regale you with my oh-so-exciting experience trying to start my own fermentation. So first things first, I should probably go over some of the vocab with you so I don’t seem quite so loony. This is Scoby Doo on day two. You can see he’s starting to make the epic journey to the top of my gigantic 10 L jar. 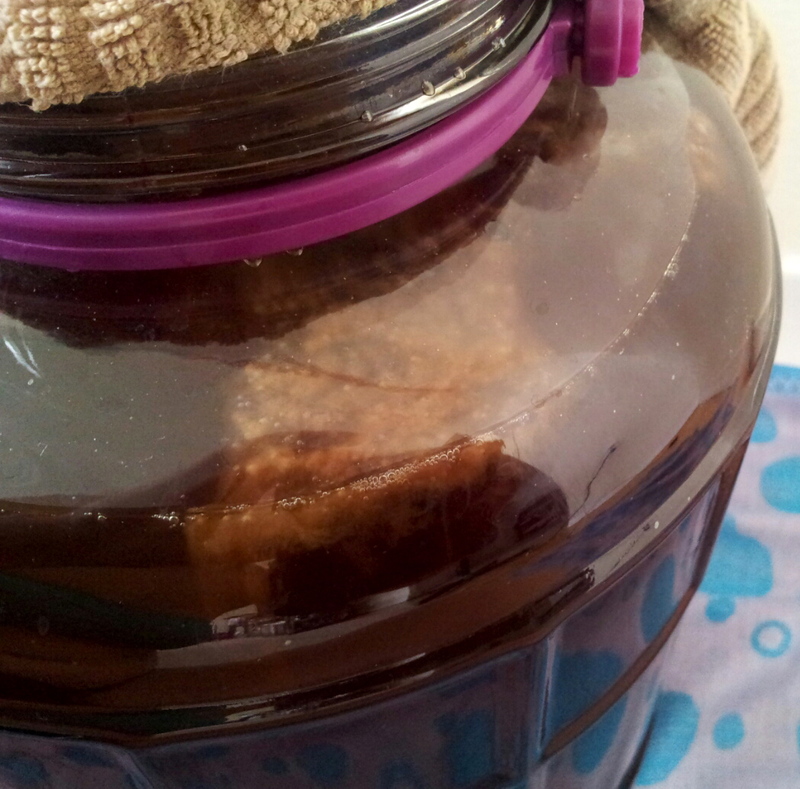 A SCOBY is actually an acronym for: Symbiotic Culture of Bacteria & Yeast. Sounds delightfully disgusting doesn’t it?! And it looks about as gross as it sounds. Essentially it’s a living organism that looks like a giant circular booger with brown tendrils hanging off of it. There’s a picture of one just over there. Looks pretty cool, huh? Anyway, you use these SCOBYs to brew something called kombucha, which at its simplest is a fermented tea beverage that’s fizzy and delicious. From what I’ve read about kombucha it’s an excellent source of probiotics, which are healthy bacteria that live in your digestive tract, help keep everything flowing in the right direction, and can help boost your immunity so you don’t get sick. We’ll go into more detail about probiotics and digestive health in another post, but suffice it to say that if your digestive tract is happy and healthy, it’s likely that the rest of your body will be too. So score one for the weird fermented tea bevvie! Kombucha is also a great source of B vitamins which help you metabolize all the delicious things that you eat and keep you energized. There’s vitamin C too, which I likely don’t have to tell you too much about since it’s a darling of the health food world. It’s great for immunity and helps detoxify your body, so win-win! 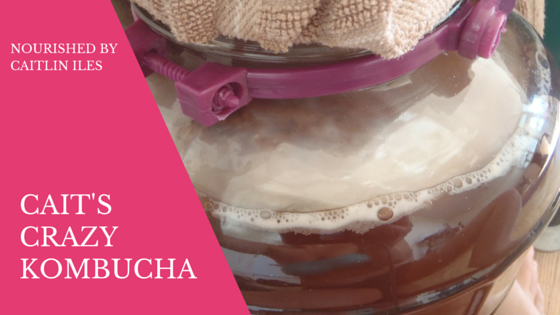 There are tons more beneficial components to kombucha and if you’d like more info, leave a note in the comments and I’ll fill you in. So I’ve drunk kombucha several times before and it’s delicious. Plus I always hear about its health benefits as a detoxifier and as an overall balancer to your body system. Being in balance is essential to good health since your body is a pretty amazing organism and if all systems are functioning properly it can keep you pretty healthy and happy. Needless to say, I was intrigued about this disgusting sounding drink, but at $5 a bottle at the grocery store, I didn’t think I would ever be able to drink it regularly enough to see any of these benefits. Scoby Doo is starting to make a baby… Anyone have any name suggestions? I have contemplated the idea of buying my own SCOBY, but I’m not always the best on follow-through so it hasn’t ever come to fruition. Until this week. Enter my friend Lauren. She’s in my holistic nutrition program and we carpool together a couple of times a week. She is also an amazing cook and baker, with a sweet blog full of recipes and contests. You can check her out at www.cravingsgoneclean.com. Anyway, back to the story. She has a friend who sells SCOBYs and asked me if I wanted one. Thank you universe for delivering to me what I was too lazy to seek out on my own! Day four and Scoby Doo has made his way to the top safe and sound! The plans were set, the adventure was in motion and so we went and picked them up after school on Wednesday and getting them home was an adventure in and of itself because they’re pretty big, about 5 inches in diameter? And you have to keep them in some of their liquid so they don’t die. But! The girl we bought them from didn’t have a glass jar with a sealable cap (you need to keep them in glass or bad things will happen), so as we drove home the starter juice splashed all over Lauren every time we hit a bump in the road, which in Toronto is about every 4 feet. She was a trooper though and we got them home safe and sound. Since we didn’t have any large glass jars in which to brew our kombucha we made the trek over to Tap Phong’s to pick up some cheap ones. Me, being who I am and believing that big is good but enormous is better, bought the biggest jar I could find, measuring in a whopping 10 L. So after we finished making our vision boards (don’t worry there’s a post coming on that one too…) and ate a delicious dinner of spinach spaetzle made by Lauren we walked up to my apartment, SCOBY and gigantic jar in hand to play Settlers of Catan. Sidebar: I was terrible, but to be fair it was my first time. After I took Lauren and her BF home it was already well past my bedtime but I was way too excited and started my brew anyway. I threw on a giant pot of water, threw in six tea bags and brewed it up. It was a little dark but I poured it in my giant jar and… it only went 1/3 way up. Lather, rinse, repeat. But to this batch I added 2 cups of brown sugar. And boy, did it fizz and foam! Most recipes say to add 1 cup of sugar but I figured since I had such a huge jar, some extra sugar wouldn’t hurt. Now the fun part. Waiting for it to cool enough to add my giant booger. Wah wah! Since I’m clearly impatient I maneuvered my giant jar into the freezer and settled in with this week’s Project Runway, which if I can just say, not great. This whole season is pretty ehn in my opinion. There hasn’t been a really great designer since Christian Siriano and it focuses way too much on the drama between a bunch of subpar designers. Give me back the beautiful clothes! Anyway, back to my story. So I don’t think I really waited long enough to add my SCOBY since when I stuck my arm in there it was still pretty warm, but at this point it was like 2 in the morning and I just wanted to get started. 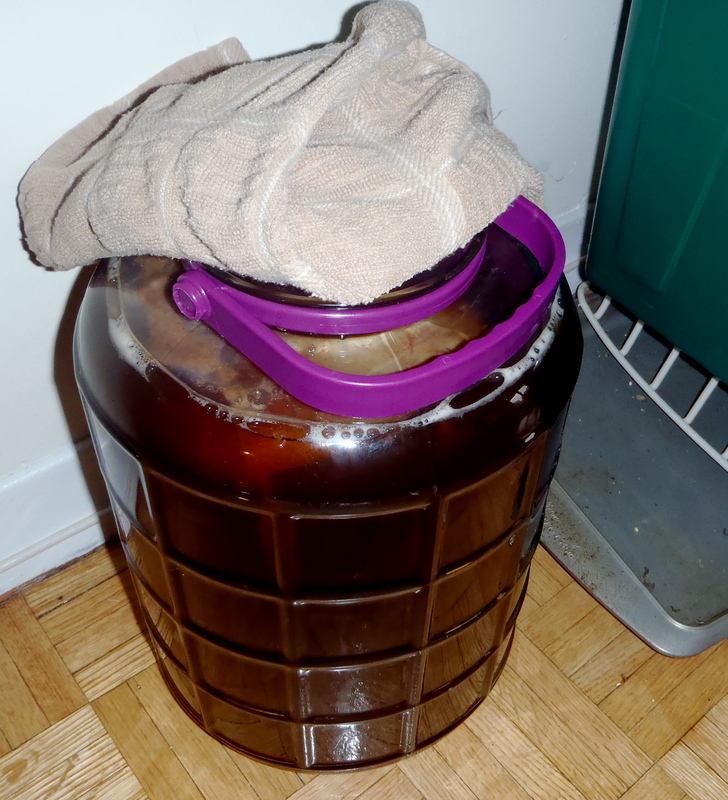 Thus, SCOBY Doo is poured into the tea, covered with a towel and set next to my worm compost. And that’s it. Now I have to wait 7 more days to find out if what I did worked or not. Look at how Scoby is making an adorable, slimy little baby! I’m so proud. 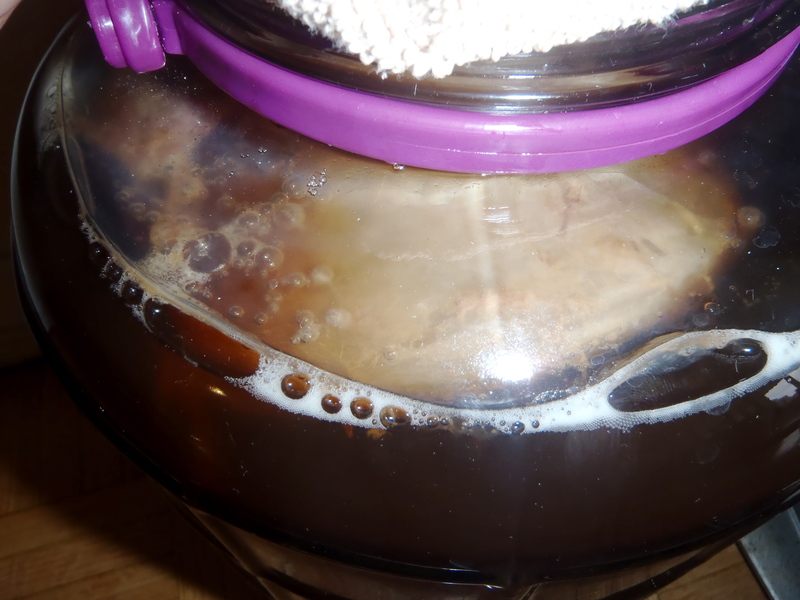 So I spent the morning talking to and encouraging Scoby Doo to grow and ferment while scouring forums to find out if I’d indeed killed my baby on the very first time out. After a couple of hours it seems as if I have not actually killed him, but time will tell. It takes about a week for kombucha to brew so you and I will both find out on Friday whether or not I am indeed a negligent mother. Until then, happy brewing! Mamma Kombucha seems to really know her stuff! Until next time, dear readers, have a whimsical day! Scoby Doo finally floated to the top of the jar! I didn’t kill him! Plus there’s a bunch of funky brown goo floating around and I’m pretty sure that’s a good sign. Huzzah! Here’s my corner of weird… or awesome depending on how you look at it. These are the only pets I seem fit to own. 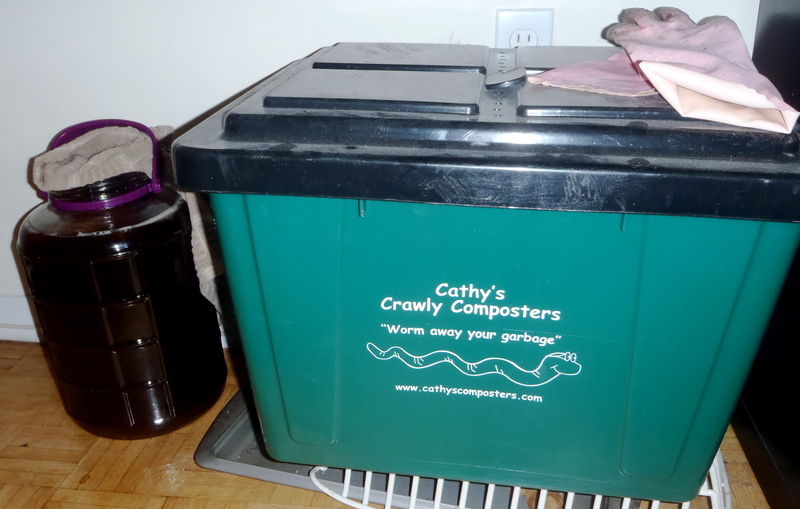 Worms and bacteria. Go me! Thanks Papa Bear! You’ll have to try some next time you make it up to TO!